SPECIAL NOTE: The entertainment roster below is actually the 2018 roster. The 2019 roster will be posted as soon as it is available. Performing extraordinary folk music in a variety of styles: bluegrass, calypso, swing, old time, blues and country. They write and collect songs detailing life in the Great Lakes region over the last two centuries. Don't miss their popular performances of Gospel Music, Songs of the Great Lakes and Tunes of the Michigan Experience, Sunday afternoon at the community center beginning at 1:00 PM. This singer/songwriter and author, brings to life songs and stories of Great Lakes lighthouses, shipwrecks, and Native American legends. As a solo artist he is loved by audiences both young and old! Bearfoot Behrend will be performing on stage at the community center, Friday, at 2:30 PM. Then at 6:00 PM, Bearfoot Behrend will be performing at Sawmill Creek Park to kick-off our Friday night jamboree. With ukulele in hand, Papa Crow creates memorable kids and family songs and presents them through fun, interactive performances. His catchy songs are sometimes silly, sometimes thoughtful and cover topics like family life, growing up, feelings, pirates, full moons, fireflies, and white pines. Expect to move a lot, sing along, and show kids how smart they are, get LOUD and learn something too! Catch Papa Crow, live and on stage at the community center on Saturday, beginning at 2:30. Singer/songwriter from East Lansing, Michigan offers folk music, influenced by her Irish roots and lore of the Great Lakes. Performing live and on stage at the community center Friday at 11:30 AM. Brings to life an 1875 Schooner Captain through a Past in Person presentation. Sharing stories of his journies through music, songs, and words of this schooner captain. What must life had been like? Get your questions answered Saturday as Michel Deren is performing on stage at the community center beginning at 4:00 PM. 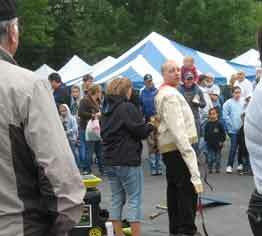 Appropriate for children of all ages, this genuine circus clown offers comedy magic, juggling, and balloon sculpting. 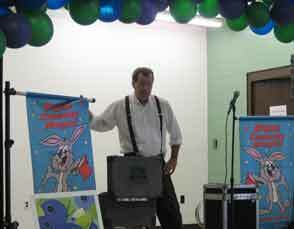 Providing a great time with a stage show at the community center, Saturday, beginning at 1:00 PM. Then strolling the festival grounds from 2:15 to 4:15 pm. Jewl's is such a fun time, we don't want the smiles to stop, so Sunday, you'll catch her on stage at 11:30 and then strolling the grounds from 1:30 to 2:30 on Sunday. Returning as a festival favorite. This mime will be strolling the festival grounds on Friday from 1:30 to 3:30. Then settling in for your enteretainment, Michael Lee, the Mime will be performing live and on stage at the community center, Friday beginning at 4 pm. Guitarist, vocalist,and local favorite, Raan brings many fond memories to every listener. Headling at our Friday Night Jamboree at Sawmill Creek, Raan's show begins at 7:30 PM. It won’t be long and you might even join in by tapping, clapping, or dancing along. 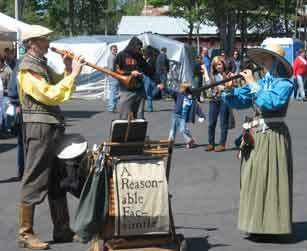 Saturday evening, Raan will return with one more performance at the Saturday Jamboree beginning at 6:00 PM. Appearing daily, this comedic juggler features action packed feats of balance, ridiculous juggling stunts, and thrilling daredevil escapes. The Chet Mitchell Comedy Juggling and Variety Spectacular will make you ask "How does he do it?" while keeping you and your family on the edge of excitement. Chet will be strolling through the festival grounds Friday and Saturday, from 10:00 AM until 4:00 PM while on Sunday he will be strolling the grounds from 10:00 AM to 3:00 PM. But this is a word of caution, Chet is a performer, if you happen to spot a life-size, bronze statue on the grounds, that just might be Chet. You do not want to miss his amazing feats. Delighting the audience with humor through creativity and antics, Richard Paul will be performing live and on stage at the community centerstarting at 1:00 PM, Friday. Giving modern America the chance to get a little taste of yesteryear by mixing foot stomping music, mind reading, hilarious stories, magic, quick banter, an astonishing fearless circus flea and most importantly Doc Pawlaczyk’s Miracle Elixir. Catch Doc Pawlaczyk's show, Saturay at 11:30 AM on stage at the community center. An accomplished piano player, singer,and member of the Michigan Opera Theatre Children’s Chorus, Soleil offers beautiful music for your listening pleasure. Start each day with a Blueberry Brunch and enjoy the piano music of Soleil Garcia-Johnson on from 9:00 AM to 11:00 AM. On Sunday, Soleil will be performing until 11:30 AM. So step inside the community center and enjoy her sweet melodic sounds. We’ll see you at the festival August 16, 17, and 18, 2019! 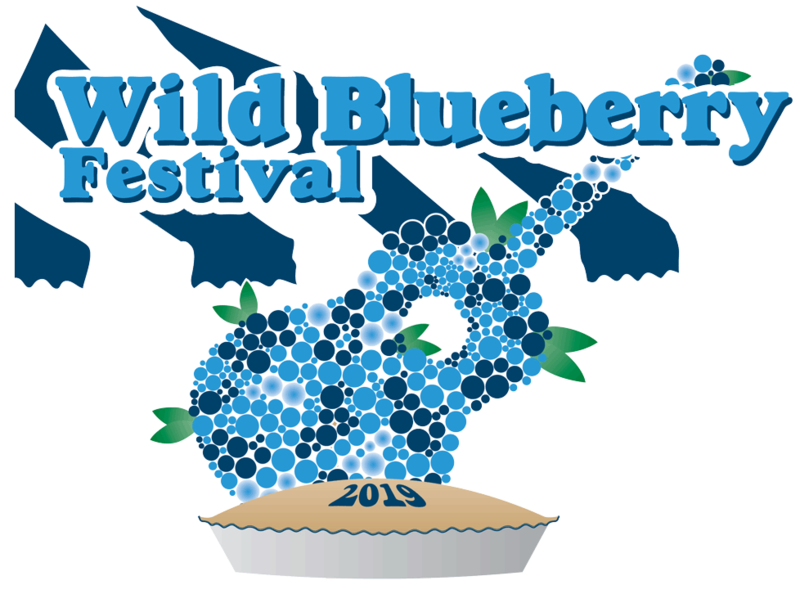 The Wild Blueberry Festival is sponsored by the Paradise Area Chamber of Commerce.